Wildlike comes with a day and date release on the heels of a massively successful festival run with over 150 festival selections and 30 prizes to its merit. (It screens at the Ottawa International Film Festival in October to up its numbers even more.) Audiences everywhere are embracing this sleeper hit of the indie circuit and the film is sure to find more fans as it expands into the new wilderness of theatres and VOD. Maybe it’s the magnetic pull of the Alaskan landscape or the subtly endearing coming of age story at is heart, but this film really sneaks up on you. The walk through the Alaskan wilderness, however, doesn’t base itself on the same inspirational fodder that most stories of personal growth do via a physical and spiritual journey. Mackenzie finds herself running for her life to escape Juneau after a brief stay with her uncle (Brian Geraghty) leads to horrible violations of her body and trust. When all one can do is run towards the grizzlies and the all-consuming wilderness, home is no place to be. Mackenzie finds a new kind of home when she breaks into a motel room and startles a hiker readying himself to walk Denali National Park. He screams and she runs, but a chance encounter the next day offers an ally for Mackenzie as the man, René/Bart (Bruce Greenwood), offers to help her find her way to the ferry that’ll take her to Seattle. Mackenzie finds this man comforting, though, and she trails him like a stray cat does a friendly feeder near the woods as Bart begins his hike towards the mountain. What begins as a spoiled vacation becomes a newfound freedom for Bart as he takes Mackenzie under his care. She’s the daughter he never had and he’s the father she lost, and the two form a nice, if odd, surrogate family as they grow and cross several miles together. The film uses the wisdom of the woods, such as Bart’s guidance to Mackenzie that one should never run from a bear, to carry the metaphor of the journey through to the finish. Wildlike expertly shifts between its three acts as the first sequence of Mackenzie’s journey, her escape, has an immediate sense of danger, while the second act, her hike with Bart, offers a great sense of relief. There’s still ample tension as Mackenzie withholds information and fears her uncle tracking her like a cougar might its prey, but director Frank Hall Green lets the natural catharsis of the open landscape offer a bracing cleanser with a nip of fresh air. Wildlike largely plays out as a two-hander as Purnell and Greenwood build an amicable rapport along the journey. Purnell impresses with her first leading role (she previously played the younger versions of Angelina Jolie and Carey Mulligan in Maleficent and Never Let Me Go, respectively) as she subtly handles Mackenzie’s fear, coming of age, and her confused ownership of her sexuality. Green offers a nuanced and admirably restrained depiction of sexual abusing that doesn’t exploit Mackenzie, yet conveys her violation. Greenwood, meanwhile, is resolutely solid and compassionate as Bart. His rugged exterior is a tough and weathered as the Alaskan terrain, but he carries Bart with a father’s strength and offers a silent, protective hero to guide the young protagonist to safety. Ann Dowd, finally, leaves a strong impact with a minor role that epitomizes kindness and charity. Her brief presence will please fans of the indie circuit who’ve been admiring her work since (or before) Compliance. Hall lets the performances and the power of the natural landscape guide the film to its restrained finale. Wildlike has a quiet, understated power that is disarmingly effective. It’s a great escape and an even better place to find oneself. 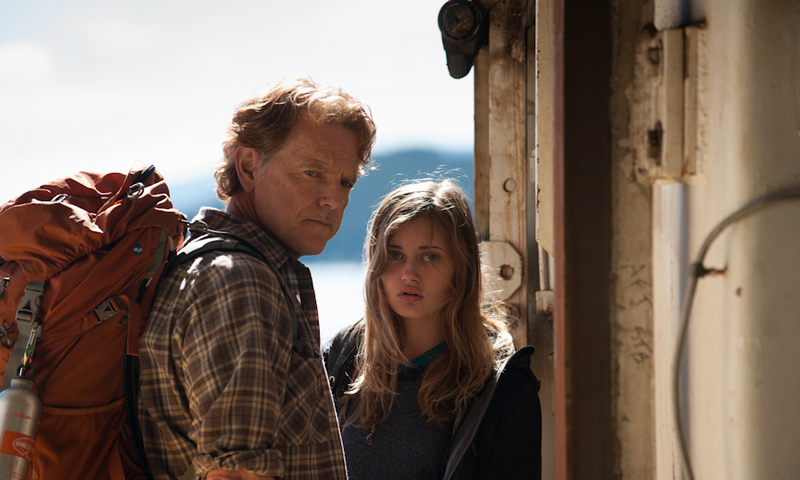 Wildlike opens in Toronto and Lethbridge on and will be available on iTunes Sept. 25. It screens in Ottawa at the Ottawa International Film Festival in on Oct. 17 at 4:00pm.